Mike Zacchea is a retired Marine Lt. Colonel who served in Iraq. "There's a marked gap between civilians and the military." "I was wounded on November 11, Veterans Day, 2004 in the second battle of Fallujah, so Veterans Day is my alive day," said Zacchea. "And it’s not lost on me the meaning that the second part of my life, the part that I’m dedicated to advocacy and activism for veterans began on the day that I was wounded. "Our combat was particularly brutal. It was day-to-day. And the insurgents were determined to destroy the Iraqi Army before it could become operational. So we were engaged every day with the insurgents, and not just engaged, but experienced all the atrocities that the insurgents are infamous for committing. "Veterans are the people in our country who have paid the price for freedom. They swore an oath to support and defend the constitution of the United States and many of us have paid with our blood, and quite a few, unfortunately, have made the final ultimate sacrifice for that oath. 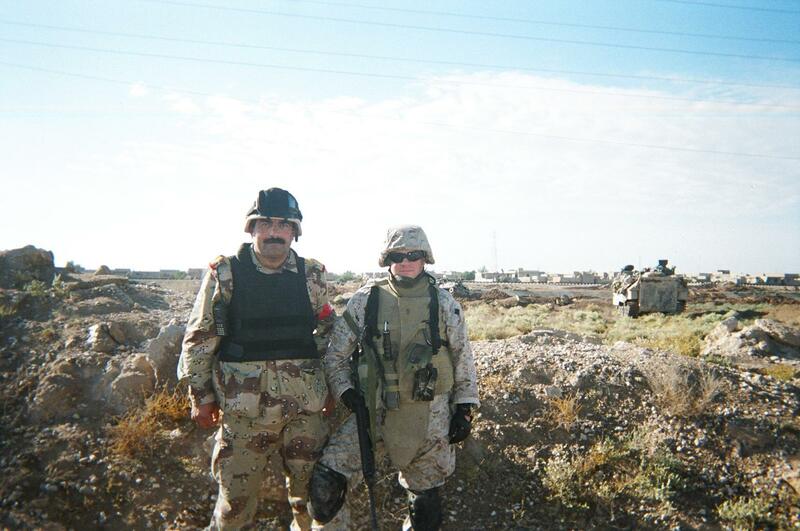 Mike Zacchea shared this picture of when he served in Iraq. "We still have veterans who are, and will today, in the time that we conduct this interview wind up taking their life somewhere across the country. Going forward, there’s a marked gap between civilians and the military. And it’s important to keep the service and sacrifice of veterans’ front and center in American’s consciousness. Mike Zacchea visited WNPR to talk about his service with the U.S. Marine Corps and his advocacy for veterans. "There’s many ways to get involved. Veterans need time; they need services; they need suits; homeless veterans need furnishings. There’s a million things that veterans need to get reintegrated into our community, not just reintegrated like it’s some sort abstract concept but into our community in Connecticut." Mike Zacchea is now director of UConn's Entrepreneurship Bootcamp for Veterans with Disabilities.